A few weeks back, Julie gave us a wonderful post about some of her favorites in Indian literature. I certainly have read my share of novels set in various parts of the desi diaspora, but I find, more often, I leave my fiction for the screen and my reading tends to follow my long held addiction: Behind the Scenes books. I am totally hooked…from my first one in college (I believe it was my old buddy Jean Cocteau’s film diary of shooting his classic, Beauty and the Beast…What an amalgamation of brilliance and neurosis…never the like to be seen again! ), I am fascinated with how these films that I love are shot, and with all the myriad details of the people who shoot them. Bollywood, would of course, be no different. 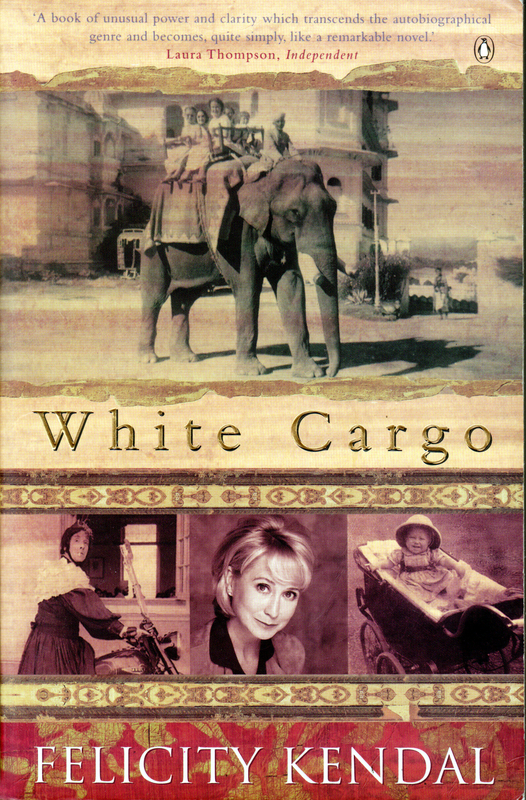 I’m going to begin this listing of my wanderings through the cinematic history of Hindi film making, chronologically, with a book that I mentioned a few weeks back, White Cargo by Felicity Kendal [Penguin, 1998, ISBN 0140271589]. For any lover of Indian film, especially of the Shashi Kapoor era, this is the perfect mix of nostalgia and poignancy. It details the formative years of Ms. Kendal, one of Britain’s finest classical actresses, which she spent in theaters all over the Indian subcontinent, traveling with her family, who comprised the troupe Shakespeareana. The story of her years with the troupe, and their adventures during their tour of the 1950s, unfold in a series of vignettes that fill her mind as she sits at her father’s bedside in the 1990s, hoping he will come out of his coma. Ms. Kendal paints a vivid canvas of a caravan lifestyle as she and her mother, father and sister Jennifer wend their way from town to town giving their classical productions for all the local villages. It’s a very exciting life for a young girl, eventually winding up with her starring in Shakespeare Wallah, a fictional chronicle of their life. The whole family acts in it, including her then brother-in-law, Shashi Kapoor, himself Bollywood royalty. A wonderful read. As anyone who has read this blog knows, I began my mania for Bollywood films with Lagaan, an award winning film by Ashutosh Gowariker, starring Aamir Khan, one of India’s finest actors. Set in the latter half of the British Raj’s occupation of India, it dramatizes the valiant struggle of a poor village to compete in a cricket match in order to forego their paying the annual land tax to the crown; it captured my imagination with its colors and song, and I haven’t been the same since. After I saw Lagaan, and found out that there were a few “Making Of” books about it, what did I do? Of course, I bought all of them that I could find. 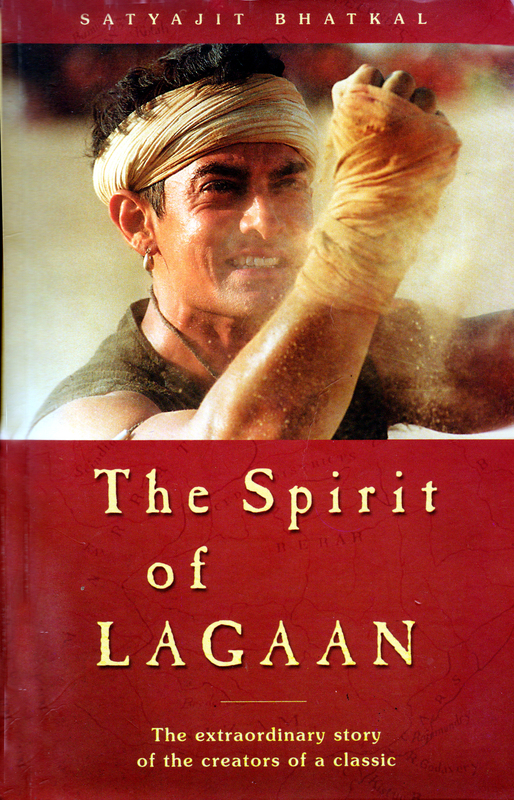 The first was called The Spirit of Lagaan by Satyajit Bhatkal [Popular Prakashan, Pvt. Ltd., 2002, ISBN 8179910032]. This is a very fun and thorough documentation of the ins and outs of the creation of this classic film, offering us images and stories, many of which have stayed with me. Like that of producer and star, Aamir Khan rising at 5 am with the rest of his cast and dozing in the bus that transported them to the set, in the dry-as-the-proverbial-bone Kutch desert. Also, a story Mr. Bhatkal told on himself about the trials he had when asked to provide a fully caparisoned elephant for a day’s shooting. No mean feat, it seems, even in India. His story [also told in the film, Chale Chalo: Madness in the Desert] is completely enjoyable, except for the photos, which are few and very small, surprisingly so, given he was the film’s official chronicler. 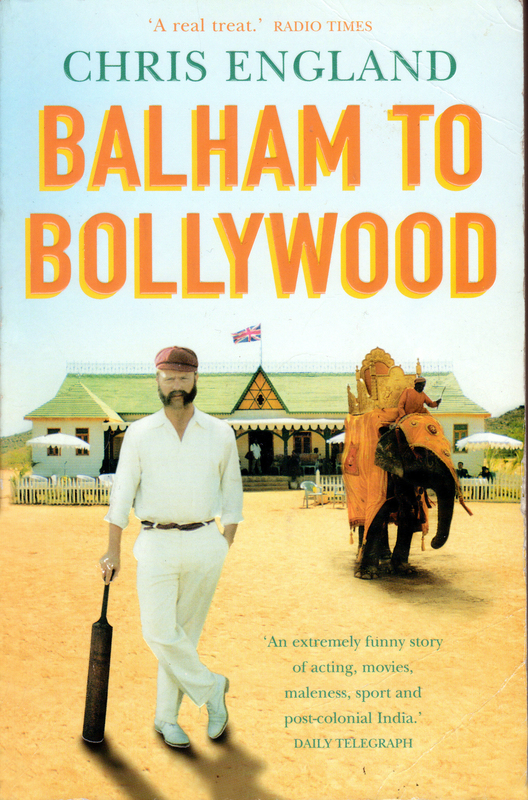 Balham to Bollywood, Chris England’s tale of the Lagaan shooting [Sceptre, 2002, ISBN 0340819898] tells some of the same stories, but from the other side of the cricket pitch. Mr. England was cast as the British cantonment’s bowler (pitcher, for the baseball counterpart), because of a) his acting talent and b) his skills as a cricketer. But the casting team had no idea the problems they’d have after finding the perfect looking actor/athlete and finding he could bat, but not bowl. This book is a completely irreverent tour through the whole saga of film making from casting to cast party with all the sordid details of daily life on the set included. Not for the faint of digestion, or the overly serious minded of readers, but I found it hilarious. Devyani Saltzman writes her tale of cinema history in South Asia from a unique viewpoint. 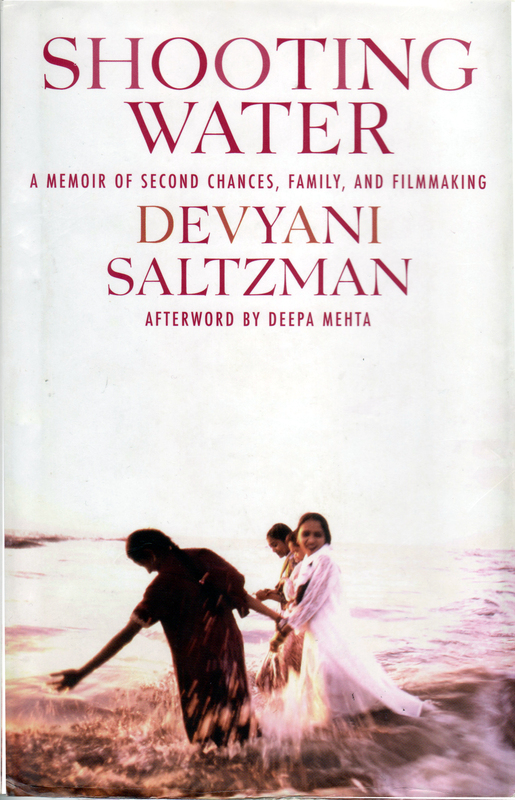 As Deepa Mehta’s daughter, Shooting Water [Newmarket Press, 2006, ISBN 1557047111] she details their life during the filming of Water, her mother’s final chapter in the Elements trilogy (with Fire and Earth). As a photojournalist, she has the skills to explore the technical as well personal efforts that go into filming a controversial drama as it unfolds from Canada, through India and on to Sri Lanka, all the while letting us see the toll it takes on the mother-daughter relationship. I found the memoir elements touching and the behind the scenes elements very informative. The photos, while good, are few, again, and in black and white, even in the hardback version. An odd situation, given her job as photographer on the shoot, but her prose is clear and fluid and I enjoyed taking the trip with her. The last two books on my list, I haven’t finished…but for two very different reasons. 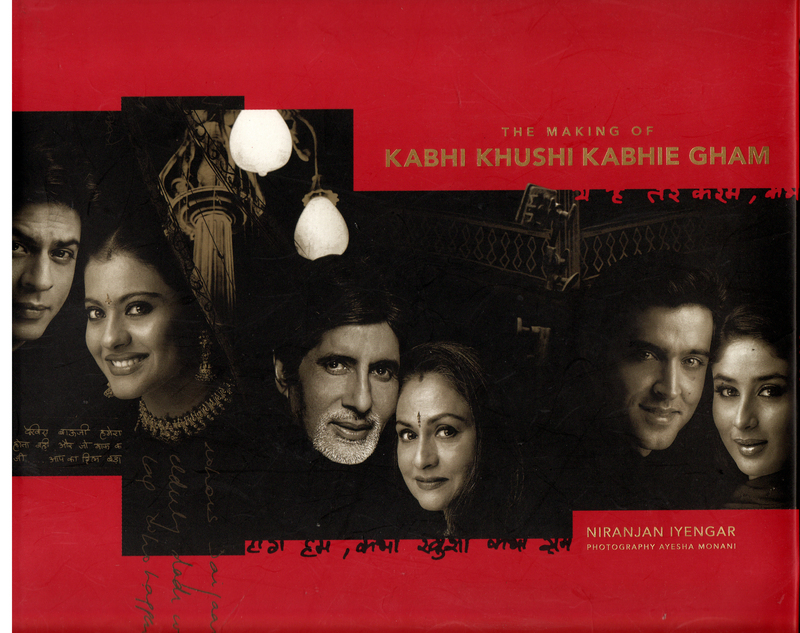 The Making of Kabhi Khushi Kabhie Gham [2001, ISBN 8175083387] is your typical blockbuster chronicle coffee table book. Written by Niranjan Iyengar, ostensibly, and published by Dharma Productions and India Book House Pvt. Ltd. It has all the lush photos you could desire in the documenting of a song and dance extravaganza. You’d think I’d just eat it up, given all the whining I’ve been doing about bad photos in the earlier books. But no. Didn’t grab me. At all. Still haven’t been able to finish it. Maybe it’s that with Dharma publishing it, it is, in actuality, an extended, director-approved advertising filler piece…and hagiography. Why, do I say this? Perhaps that it’s filled with piles of purple prose all pointing to one purpose?…all but deifying the film’s director, Karan Johar. I’ve never seen a book like this before that has as many images of a director (all carefully chosen, I’m sure, for the best angles and sufficient seriousness shown); almost more than of his stars. I’m not exaggerating, or not by much. I checked. Photos of Amitabh, Hrithik, Jaya and Kajol; 37, 35, 32 and 32, respectively, while Karan had 25 photos of himself in there, quite a few of them as large and glossy as any matinee idol could desire. But poor Kareena Kapoor…a measly 20 shots, and only Shahrukh, of course, steals the lion’s share of the photo “exposure” at 51 portraits. Sheesh. No wonder I’m left with a very narcissistic aftertaste from this very overpriced book. The other book that I haven’t finished yet, is Take 25: Star Insights & Attitudes by Bhawana Somaaya [Sambhav Publishers, 2002, ISBN 8190135414]. A formidable film journalist with degrees in psychology and the law behind her, Ms. Somaaya is one of the few commentators on Indian film that I actually take seriously. Really…if you love the medium like I do, you just ache to read something about the films that has some meat to it (beg pardon, to the veg portion of my readers), and all we get to sate our curiosity is the fluff of Cineblitz and Filmfare fodder. Personally, I don’t give a flying falooda (or would like to, a la Glee’s Slushee attacks) about where on her European vacation Rahkee got her faaabuulous handbag, but most filmi-journos seem to think I do. But Ms. Somaaya has been writing intelligent interviews and actual think pieces on the actors of India and their films for over thirty-five years now (25 when this book was written, hence the title) in publications as varied as the Hindustan Times, The Hindu, The Pioneer and Newstime. Right now she is Editor in Chief at Screen Weekly, a slight publication if measured by size and gloss, but head and shoulders above any of the others in serious content. This book, Take 25, though very hard to find now (even on her website or her new blog ), is a compilation of some of her favorite articles published to date, all filled with wit, whimsy and insight, and is well worth reading. 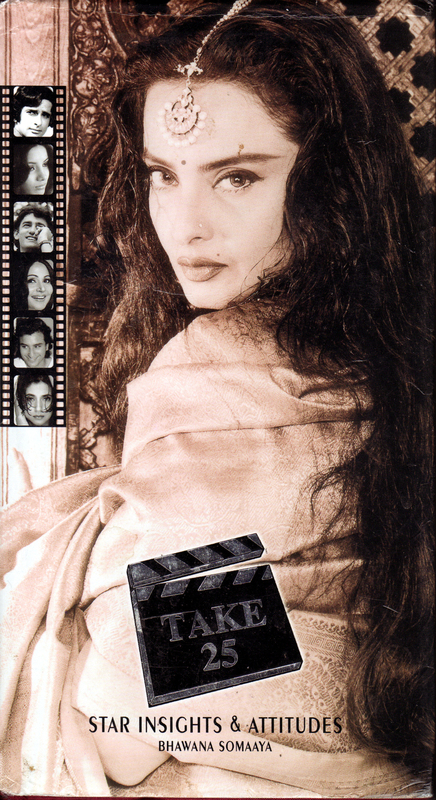 And the reason I haven’t finished it is this: Five hundred and eighty four pages; and all interesting, especially for those of us who have been researching older Bollywood fare. I must say, on a strictly superficial note…what was the publisher thinking to put it out in a 5 ¾” by 10 ½” format?? It’s the oddest sized book I’ve ever bought, bar none. Doesn’t hurt the quality any, though. So that’s my current take on the “Making Of’s” that are out there. I have two or three more on my shelves, waiting. Sholay: The Making of a Classic, and one on Dilwale Dulhania le Jayenge, both by Anupama Chopra, and Fantasies of a Bollywood Love Thief: Inside the World of Indian Moviemaking by Stephen Alter (don’t you love that title?) all with varying degrees of promise, so you might expect a follow-up post sometime in the future. Feel free to recommend your favorite Bollywood non-fiction to me, as well. Enjoy! The only non-fiction book on Bollywood I have read, so far, is the disappointing “King of Bollywood: Shah Rukh Khan and the Seductive World of Indian Cinema,” which was on the new non-fiction book shelf at the library a while back and drew me in with its lurid pink cover. Ostensibly about the Indian film industry as a whole, it was less that than an “insider’s” biography of SRK, and the discussion of the rest of the industry was only at those points where it touched The Man’s experiences. Even though the author, Anupama Chopra (yes, of THOSE Chopras) had unprecedented personal access to the star, the biography curiously gave nothing that hadn’t already been discussed in numerous newspaper and fan magazine articles (which she cites at length in her bibliography). In fact, the author is shown interviewing him for the book in the film “The Inner and Outer World of Shah Rukh Khan,” a much more useful and interesting insider look at what makes him tick. If you are a new SRK fan and wanted to learn everything about him in one place, I would recommend checking out “King of Bollywood.” Rabid fans will want to have it on their shelves, well, just because. But anyone in between, who has been keeping up with him all along, will likely find it boring.